A crusader, haunted by grief and guilt. A bride-to-be, struggling with old yearnings and desires. 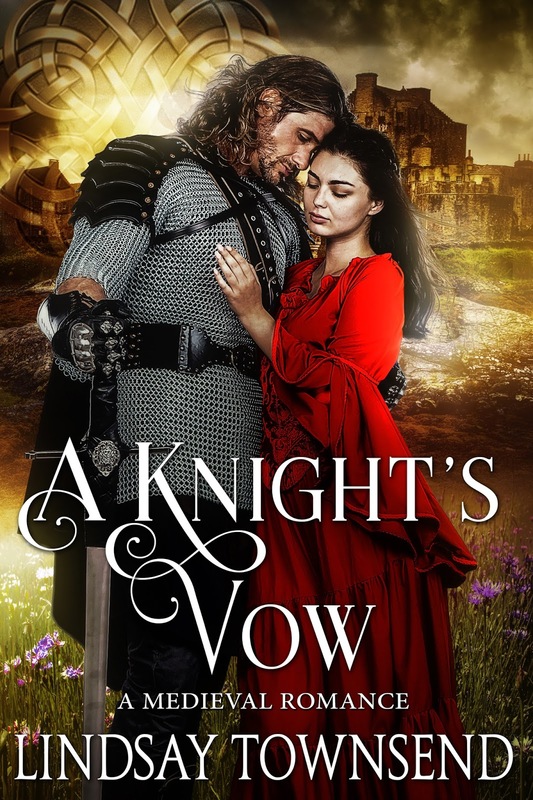 Can Sir Guillelm de la Rochelle and Lady Alyson of Olverton rediscover the innocent love they once had for each other? When Guillelm makes a fearful vow on their wedding night, is all lost forever between him and Alyson? And will the secret enemy who hates their marriage destroy them both? 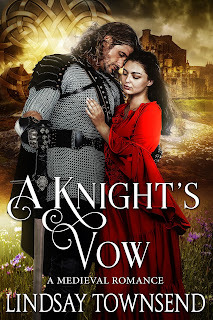 “A Knight’s Vow” is a tale of romance and chivalry. In a time of knights and ladies, of tournaments and battles, of crusades, castles and magic. Alyson heard the shouts from the surviving men-at-arms and jerked her head up, all thought of prayer forgotten. ‘My Lord Dragon,’ she whispered. Struggling to rise to her feet from the hard cold floor of the small narrow chapel, she re-pinned her simple veil and pinched colour into her gaunt cheeks, feeling her heart begin to race. ‘Can it really be true?’ She had waited for him for so long, she could scarcely believe it. Guillelm, here, in his family’s castle of Hardspen. For a moment she felt stunned with happiness. ‘My lady!’ The reedy voice of her seneschal, Sericus, floated above the hubbub in the great hall of the castle, calling ahead as he tottered on gangling legs to find her, to bring her this miraculous news. ‘I am here!’ Alyson called, darting from the chapel. Sericus was lame, and to save his withered limbs she picked up the hem of her plain brown gown and hurried down the spiral staircase of the keep, a small, slender girl with a mass of long black hair, large, very dark blue eyes and delicate features whose naturally bright, high-coloured complexion had been dulled by weariness and grief. Longing to see Guillelm, she was reckless in her haste on the torch-lit stair, where only her natural fleetness of foot prevented a fall. Would he remember her? She had been fourteen years old when he had answered the call of his kinsman, Raymond of Poitiers, and gone with him to the Holy Land. He had been in the exotic, dusty lands of Outremer for seven long years and she had despaired of ever seeing him again. For the last three years, with no news of him, there had even been the terrible rumour that he was dead. But he was alive! Was he greatly changed? Would she be the one who would have to tell him that the enemy forces ranged outside the main gate were poised to attack? That his father, the noble and intimidatingly austere Lord Robert, had been dead for ten days? That for the last month she had been living in Hardspen as Lord Robert’s intended betrothed? Chilled and appalled by these thoughts, Alyson halted in the shadows on the final step, raising a finger to her lips as Sericus came out of the hall in search of her. Sericus, understanding her wish without the need of speech, passed by her and limped out of sight of the travel-stained men standing by the log-strewn fireplace in the great hall beyond them. ‘Lady, where are your serving women?’ he asked in an urgent whisper. ‘Gila and Osmoda remain in my chamber: they are still sick, as are many within this castle.’ Alyson had left them sleeping, no longer feverish but weak. ‘You will be with me, Master Sericus, and that is enough,’ Alyson replied, with a smile of gratitude. ‘You have seen to our guests’ comfort?’ She blushed at calling the new lord of Hardspen her guest, but Sericus merely nodded his head. ‘Then pray allow me an instant to compose myself. And sit a moment, I beg you.’ Sericus had been without sleep for the last three nights, as she had, helping her with the sick and with the ordering of Hardspen’s human and physical defences—the re-mortaring of sections of walls, the gathering of stores, the checking of weapons, as their enemy outside the gate waited in arrogant strength. ‘My lady, you are ever gracious.’ Lowering himself onto the stone treads, the wiry, grey-bearded, grey-haired man sat with a tiny grimace of relief. Sir Guillelm de La Rochelle. She picked him out easily from the small group of soldiers who drank and warmed themselves—for although it was summer the nights were cold—by the crackling flames of the sweet-smelling apple wood. Tall as a spear, he towered over everyone there, long-backed and long-legged, with broad shoulders and lean hips. He was speaking quietly to one of his men, his back to her and with the dark hood of his cloak still pulled over his head as his powerful body steamed and dripped water from the relentless summer rain outside. ‘My Lord Dragon,’ Alyson breathed a second time, using the nickname she had given him and which he had made his own. She missed the sight of that mane of bright golden hair and even more his grimly handsome face but it was enough to know he was alive and safe. Giddy with relief, she now heard him speak for the first time in seven years as a castle defender asked how he and his few retainers had passed through the enemy lines. ‘Your commanders, Lord?’ asked his interrogator hopefully, picking up on the thread that Alyson had noticed, although she was distracted by Guillelm himself. He had turned to face his questioner and she could look upon the face that had haunted her dreams for so many years. Eagerly she stared at him, feeling like a thirsty traveller coming to a well of pure, life-giving water. His was a lean, clean-shaven face, tanned by the blazing sun of Outremer, with a faintly aquiline nose which as a girl she had always longed to trace playfully with a finger. If he had changed, it was only to grow yet more handsome, with lines of character and decision etched into every uncompromising feature. She now caught herself wondering what it would be like to kiss that firm, full mouth. There was laughter, no doubt as Guillelm had intended. Taking advantage of the lighter mood, he called for more ale. There was a scramble amongst the oak tables set against the longest wall to retrieve the pitchers of ale that Sericus had brought up from the winter stores. Watching how readily the men obeyed him and recalling her girlish hero-worship of the youthful Guillelm, Alyson sternly reminded herself of her duty. She must keep these unseemly feelings of longing within bounds. She was to have been Lord Robert’s betrothed, affianced in a ceremony as sacred as marriage and now almost a widow. How then dare she entertain such unruly desires for Lord Robert’s son, a wish that she might kiss him and be kissed in return, enfolded in those strong bronzed arms? ‘Lord Robert,’ came the sombre response from the men. ‘Robert,’ Alyson whispered, tears standing in her eyes as she remembered him and also, even more painfully, the death of her own father three months ago at Easter. For Guillelm’s sake, she prayed that whoever had told him of his father’s passing had done so with kindness. Dashing her tears away with a trembling hand, she raised her head and smiled at him, hoping that, although he would not see her, he might sense her sympathy. Incredibly, as she smiled, he looked down the length of the great hall, straight at her. His eyes, deeper-hued and richer than the rarest of velvets, widened as he saw her, capturing Alyson in his dark, compelling gaze. I could lose my heart to Guillelm and consider the danger of his breaking it well worth the risk, she thought, while an inner voice said, You already have. For an instant both were still, wrapped in each other’s glances, but then an indignant shout from Sericus behind her and the raking of greedy clasping fingers against her shoulder warned Alyson of another, very different kind of danger. Breaking free of the pawing hand, ignoring her foul-breathed assailant’s grumbled, ‘Give me more ale and a kiss, girl!’ she whirled away from him and sped into the great hall, furious at the laughter of the other men-at-arms, those who had arrived that night with Guillelm. ‘Thierry!’ Guillelm shouted, his voice full of warning, and then Alyson heard him curse violently in an unknown tongue, possibly one of the languages of Outremer. She saw him thrust his half-drunk goblet at his nearest companion and stride towards her and her unwelcome follower, reaching them in less than ten paces. He thrust the man so violently aside that Thierry careered into one of the oak tables, where he crouched, rubbing his arm and clearly glad to be out of range of his lord‘s displeasure. Guillelm had no time for him. He lowered his head to Alyson, the hood of his cloak slipping down and revealing that glorious mane of blazing golden hair, bright as a dragon’s flame. ‘He has done you no harm?’ he asked softly in English, his deep-set eyes narrowing in concern. ‘No.’ Alyson stared up at her rescuer, more than ever conscious of her rekindled admiration for him while at the same time guiltily aware that her habitually plain clothing had in part caused this confusion. Had not her old nurse Gytha complained that she dressed more like a serving maid than a lady? ‘No, my lord,’ she said, knowing she should make some effort to give an account of herself. She sensed from the abrupt silence in the great hall that Guillelm’s men had now been told, in hasty whispers from the others, who she was. She could feel Sericus hovering close by, awaiting his instructions, poised for the slightest signal from her to make a formal introduction to Sir Guillelm de La Rochelle on her behalf. But what was the use? she thought bleakly. He does not remember me! She felt her eyes fill and averted her face. She had been barely on the verge of womanhood when he had left for Outremer, and they had been only friends: a chaste four-month companionship of an older youth and a young girl. Guillelm had been indulgent with her and she had foolishly taken his kindly dealings as a sign of hope for the future. A false future, as it turned out, for Guillelm did not remember her. Not even after their trial together in the woods, when they had saved each other…. But she would not remind him. Pride would be her saviour now. She felt his fingers under her chin, their gentle touch almost undoing her. She lifted her head, bracing herself to explain who she was and how it was that Hardspen was so lately run down and under threat of imminent siege. She found herself staring at a brutally handsome, smiling face, dominated by a pair of brilliant dark brown eyes. ‘Yes, my lord?’ Alyson prompted, as he fell silent. Was he aware of every man in the room avidly watching their exchange? Already ill at ease, she wanted to run from the great hall and keep on running, far into the rain-swept night. The instant he spoke, Guillelm thought, What am I doing? Only a few hours earlier he had been standing before his father’s tomb in the tiny local church of Olverton where Lord Robert had been buried, his head full of memories and grief. Only yesterday, when he disembarked from his ship at Bristol, had he learned that his father was dead. With that dreadful news and Hardspen castle under threat he had no time for idle, pleasant gallantries, even with a serving maid as pretty as this one. And yet this dainty, dark-haired serving maid had given him such a smile of welcome, and of sympathy, that he had been comforted. She had not mocked him or flinched, she had given him instead a look of recognition, as if she knew him. She was familiar to him, he felt; as familiar in some ways as the breath in his body, but his mind was moving slowly tonight, trying to take in the loss of his father and his own sudden coming into his inheritance. He had responsibilities to face; the fate of many lives had been placed by God into his hands, and he must be equal to it, not distracted by this girl who reminded him —of what? Something he had put aside long ago, with pain and regret, as being out of his reach. But what was the use of these thoughts? he reflected, trying to fight off a well-worn, familiar despair. Women feared him— his elder sister Juliana had been proved right about that. What had Heloise of Jerusalem said to him when she had dismissed his suit? ‘You are too big and brutal, my lord Guillelm,’ she had drawled, her hazel eyes widening as she revelled in his frozen expression of shame and distaste. ‘They call you dragon on the field of battle —you would burn a woman to ashes in your marriage bed.’ He had stumbled out of Heloise’s hot airless chamber, the sight of her opulent, silk-draped body, artfully arranged blonde curls and beautiful mocking face burning like a brand into his memory, her scornful voice singing his ears. Thierry again, damn the man to hellfire! Guillelm thought, scowling at the interruption and his men’s laughter, swiftly stifled as they registered his anger. To Guillelm there seemed to be a challenge in her words. He took a step closer, amused when she stood her ground. Again, a strange sense of recognition shot through him, an instinct that he knew her very well. Or was it merely that he found her pleasing? the cynic in Guillelm asked himself. Even when she had been standing in the shadowy stairwell, sequestered like a nun by that drab gown and veil, her beauty had shone through, brighter than any torch. She was more than a head shorter than him, small and fine-boned, so that he felt clumsy beside her, and yet she moved and carried herself as boldly as a warrior, as though she had no fear of him. As she stood before him now, he could smell the perfume of her hair, the scent of rosemary filling his nostrils as he quelled a sudden, powerful desire to tug off her veil. From the few stray tendrils escaping the edges of that plain cloth to frame her flawless, heart-shaped face, Guillelm knew that her hair was black: very black and fine and straight. He guessed it would be long, reaching as far as her slender waist: fine shimmering tresses that a man could lay his head on for comfort, love. ‘My Lord?’ she inquired softly as he took her hand in his. It was a work-roughened hand, resting in his as lightly as thistledown. This close, he could see the dark shadows under her eyes, the taut, bleached look of her cheeks and was pierced by pity for her weariness. This little maid had clearly done much in this castle but where was her mistress, the new lady of Hardspen? he thought, caught in that instant between anger at the unseen chatelaine and protectiveness for her maid. He had heard rumours tonight that had set his teeth on edge: that his father had married again, that there was a widow in this keep, but he had seen no sign of such a woman. ‘Mother of God, why are you alone with this?’ he murmured, running a thumb gently down the side of her cheek. He felt her palm, still trapped in his right hand, tremble against his. The heat of her fingers and the warm silk of her skin stirred him afresh, making him forget all else. Telling himself he was only doing this because his men would otherwise consider him soft, he lowered his head and kissed her full on the lips. Only a few moments had passed since Guillelm had saved her from the odious Thierry and claimed his reward of a kiss. In the final instant, Alyson feared to allow him anything more than the most chaste of embraces, afraid of revealing too much of her own feelings, but now his mouth came down on hers and she was lost. As his lips brushed hers, she felt a shock of feeling tingle down her body in an astonishing wave of heat. She felt his arms clamp around her slender middle, gathering her closer, lifting her to him. The great hall and the men gathered in it fell away to her, there was only Guillelm and the strong yet tender embrace of his mouth. She knew that she would probably regret it, but it was a wish come true. Sighing, Alyson swayed against him, closing her eyes as the voluptuousness of his kiss overcame all thought of her duty. Guillelm, no more aware of the raucous cat calls of his men than Alyson was, made himself break from their embrace. After Heloise he had a horror of forcing himself on any girl—he had not had a woman for some time—but now this slender black-haired maid was storming his defences. Her lips were so generous and sweet, and the way her hands brushed shyly against his chest and shoulder as if she learning him was so fearless that he did not want to let her go. He caught her back and swung her into his arms, conscious of a terrifying instinct to bear this woman away somewhere private and alone and have his way with her. He reached the staircase without knowing it, the questions and comments from the men and soldiers in the hall bouncing off him like rainwater. And then he knew her. By her nickname for him and her total fearlessness, and, when she opened her eyes, almost as if she had sensed his recognition, by her solemn dark blue eyes. Eyes he had seen fixed on a patch of herbs in her father’s kitchen garden, or on the stained glass windows in church, or on his own hands and arms as she soothed his various cuts and bruises from the practice field with her potions. He remembered her as a studious child, quiet and serious, passionate about healing and wishing to tend all living things, yet with a smile brighter than gold. He remembered a day in the forest, when she had saved his life. She was here with him again, in Hardspen and in that moment of realization, Guillelm forgot all other grief and concern in a burst of possessive pride and joy. He kissed her again—he could not help himself. She was the best part of his past and to see her now, safe and adult and even more lovely made him want to laugh out loud in mingled astonishment and delight. She had been so still when concentrating on her herbs and healing and yet so quick and nimble when they had run off together, racing each other to the meadows and woods. As a tall gangling lad of nineteen he had hoped to make his fortune, earn renown throughout Christendom and then return to her father’s manor at Olverton Minor to marry her. But in the end that had been a hopeless quest. Alyson’s father, Sir Henry, had seen to that. The memory of his meeting with Sir Henry blazed through Guillelm. Even after seven and a half years it was a bitter thing that left him sickened inside. All his years in Holy Land he had fought to put the memory behind him. He had thought he had succeeded, until tonight. ‘I will never give my daughter to you, Guillelm de La Rochelle,’ Sir Henry had told him. ‘She is a thoughtful, clever girl who, before she knew you, spoke of a sincere desire to enter the church as a nun. Until she knew you, Guillelm, Alyson’s steadfast goal was to be a second Hildegard of Bermersheim: a scholar and sacred mystic, a healer. You have almost driven that noble aim from her head, with your endless talk of quests and chivalry. My reeve tells me that you are much in her company, and often without the presence of her nurse. Alyson is on the brink of womanhood. These outings between you must stop—yes, I know they have been so far innocent but I have my child’s reputation to consider, and my own. Soon after that painful and disastrous encounter, Guillelm had announced his intention to go with Raymond of Poitiers to Outremer. ‘Alyson of Olverton.’ Guillelm now gave the grown-up Alyson her title, at once entranced and saddened that she should be here. She was glad to see him, but how long would that last? How long would her innocent fearlessness of him last? He could not bear to think of her turning from him with fear in those dark blue eyes, the same blank-eyed fear he had seen in women’s faces while on campaign in Outremer. Slowly, with regret and no lessening of his own desire for her, he left the small landing and, crouching slightly to avoid the low roof-space, he carried her up the narrow spiral staircase to the chapel, where a small candle was burning. He set her down carefully on the stone floor and, so that his fingers would not linger too long on her, or give in to the violent temptation to touch her again, he put his hands behind his back. ‘Alyson.’ He swallowed the urgent questions that he wanted to ask—Was she well, had she ever thought of him while he had been away in Outremer, was she still unmarried?—and asked just two things, both equally pressing.